BIM is a digital design toolset which facilitates integrated project delivery by providing an opportunity for design team members to break out of individual silos and work together in a collaborative way. Benefits of BIM include increased visualisation for the Client at project concept stage, opportunity to build the building before construction stage which results in building it right once and most importantly BIM optimises facilities management through the life of a building. The life cycle of a building is fundamental and operational costs represent approximately 80% of the overall building cost. In Ireland, awareness of BIM is increasing and designers are slowly adopting its use on projects. The lack of speed in uptake is due to the fact that the industry has not yet been persuaded to adopt this technology and the demand by Clients appears low.In my opinion this is a direct result of BIM awareness by Clients and Designers. The progress in Ireland is unlike the UK where the government have applied a ‘Push – Pull’ approach to achieve the government construction strategy which aims to transform the entire construction industry. The UK Government Strategy aims to reduce whole life cycle costs of building and infrastructure by 20% by the end of the current parliament. As part of the strategy the BIM Initiative aims to improve cost, value and carbon performance. The strategy includes the mandatory use of BIM Level 2, a managed 3D environment held in separate BIM tools with attached data (not a fully integrated model), on all public sector projects by 2016. Quantity Surveying BIM opportunities currently exist. 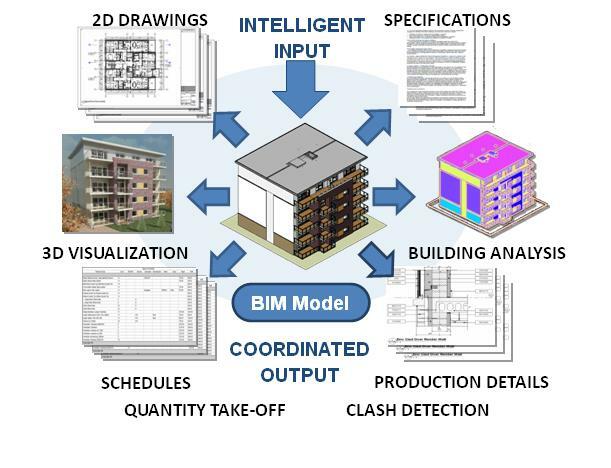 These include early input and use of the BIM model to provide enhanced ‘Optioneering’ services to Clients, a potential role of model exchange facilitator, enhancement of the existing clash detection of design role, and significant direction and input into the BIM execution plan. BIM worldwide case studies have highlighted capital cost and programme reductions as a direct result of BIM use. Reduction in operating costs is expected to be significant; savings will be attributed to the intelligent information produced by the model. The Irish Construction Industry must adopt collaborative working approaches and BIM technology now. There is a real potential to export professional services, to the UK and worldwide, while also leading innovation for Clients. The key to embracing BIM is education and awareness the time for up-skilling is upon us!